All made from 18/8 food grade stainless steel. Holds up to my rough and tumble boys, and provides them with a sporty looking water bottle that is reusable time and time again. Healthy for him, and healthy for the environment. 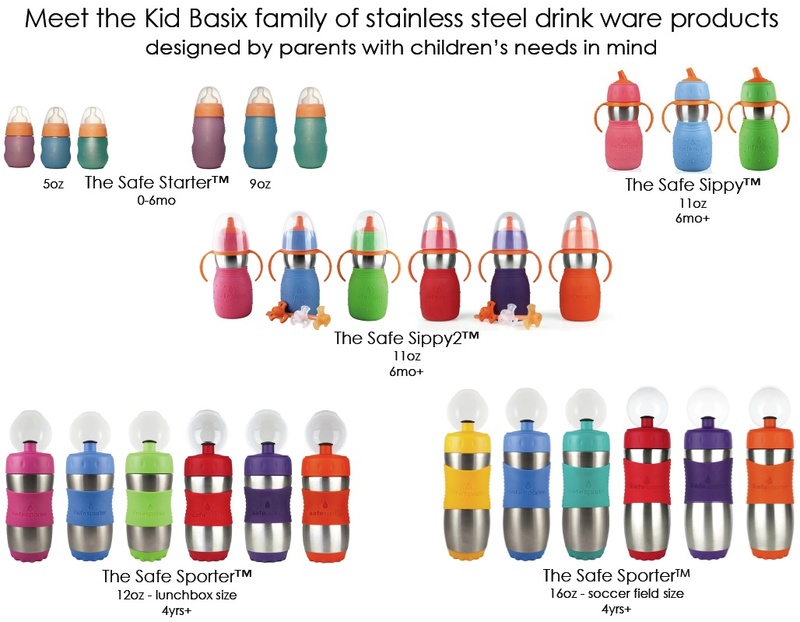 The Safe Sporter is a 16oz bottle, which is the same size of most water bottles we drink and throw away! Perfect size for the kids out on the sport field, long road trips, bike rides and more. The colors are bright and easy to find during quick breaks. The variety of colors makes it easy for larger families to choose a different color for each family member for using on trips. Unique to this Safe Sporter is the Mud cap. I love how it is hinged right onto the lid of the spout. It is going to keep the spout clean and free of mud and dirt with the clear cover, and you aren't going to loose it! The pull spout is easy to use for little hands! I love how the opening is wide enough for ice cubes, so many stainless steel bottles I can't put ice in as the opening is just too small. These fit great into the cup holders in the car, no tipping over as they aren't gigantic, and the bottom is just the perfect size. Easy to grip for youngsters as well, especially for the kids in the dropsy stages of life. I have one of those staged kids, and he didn't even give this solid cup a ding! Heavy duty, easy to clean, and the kids love it! Kid Basix is giving my readers a 20% code until Oct 1st!! Stock up on your stainless steel cups now for holiday gift giving. Use code jubilee20 at the checkout! This seems like a great product. I love the cap to keep it protected while it's bouncing around in the diaper bag.